We have a large selection of inexpensive custom printed pill holders. 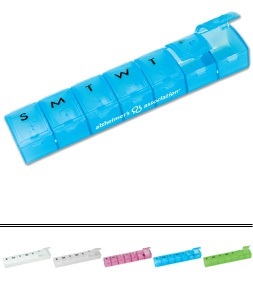 Pill holders are made with multiple compartments, some for each day of the week and some that include an adhesive bandage dispenser. 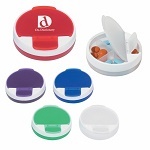 Travel pill holders are great for doctor's offices, pharmacies, hospitals and health care trade shows. 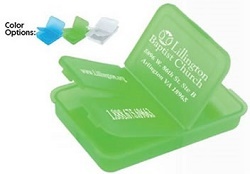 Personalized with your logo, name or contact information, Pill Holders keep pills conveniently contained while your advertising message is viewed frequently. Slotted Pill Box. Use for pills, small jewelry items, or odds and ends. 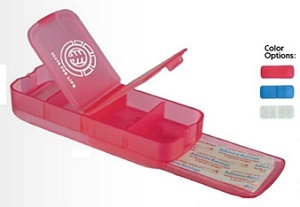 Hospitals, doctors, pharmacies and health-conscious professions can truly benefit from this slotted pill box. Weekly Pill Dispenser. A traveler's necessity and a life-saver at home. Be organized for the week one day at a time. Pill Box Bandage Dispenser. Includes 5 latex fress adhesive bandages. Great for promotional hand-outs, perfect for healthcare, sports, outdoor activites.